Mole% is a way of expressing the oxide formula of a fired glaze or glass (technicians can extrapolate fired properties like melting temperature, thermal expansion, hardness, resistance to leaching, etc. by examining the chemistry of a glaze). 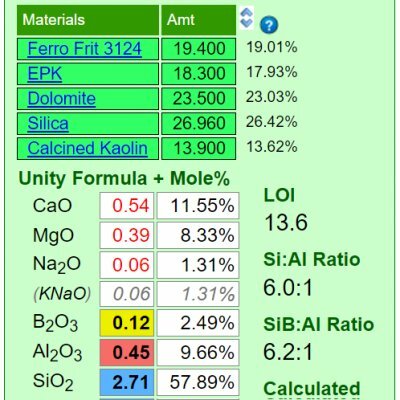 Mole% is preferred over the Seger unity formula by many technicians who use glaze or glass chemistry. Mole% is one of the calculation types in Digitalfire Insight software and Insight-live.com. Mole% expresses the percentage of oxide molecules by number (as opposed to an analysis which compares their weights). The Seger Unity formula and the Mole% formula are both simply retotals of a raw formula. Consider a raw formula as simply a tabulation of the total number of molecules of each oxide type in a sample. The formulas of batch recipes of different totals therefore also have different totals. Mole% is an expression of the percentage of each oxide type. A Seger Unity formula retotals such that all the fluxes total one. Thus Seger formulas have small numbers, all are less than one except for the SiO2. 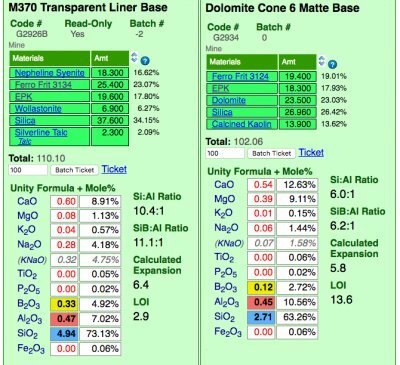 When one works with unity formulas in glaze chemistry, changes to a recipe often change only some of the numbers (or only one) in the formula. For example, if the silica weight is adjusted, only the SiO2 amount in the formula will change. However with Mole% all of the numbers change with any change in the recipe. Thus Mole% is more about seeing the concentrations of oxides in the whole than about comparing their concentrations. Following is an example of how to convert a raw formula to a Mole% formula. The formula is simply totaled and each number then divided by that total times 100.